The last installation of Knoxville Lost and Found's "Gaps of Gay Street" series focused on 322 S. Gay St., the "Terminal Building." This time we are heading north, passing the "Century Building," and landing on the next hole in the Gay Street fabric, 308. We're also going to focus on a building that I initially thought was gone, but later discovered is still there hiding in plain sight. We'll get to that later. This story starts out with a trip back to gilded age Knoxville and one of its most illustrious citizens Charles McClung McGhee. I could not even begin to delve into the person that was C.M. McGhee. His influence in this region was vast and still affects us to this day. If you would like to know as much as possible about Mr. McGhee, William MacArthur wrote the definitive dissertation and you can find it here. The short version is that Mr. McGhee made a lot of money starting in the railroad business and becoming a financier and smart investor. He had deep ties to the Knoxville area (his great-grandfather was James White), so he had keen interests in the civic pride of the city. McGhee was responsible for the siting of most of Knoxville's railroad tracks. McGhee often formed partnerships with another of Knoxville's most illustrious industrialists, E.J. Sanford. Together they founded the Knoxville Woolen Mills, the Lenoir City Company, and acquired the Coal Creek Mining Company. Today, C.M. McGhee is probably best remembered for his greatest gift to the city, the Lawson McGhee Library, which is named for his daughter May Lawson McGhee who died at an early age. His grandson, McGhee Tyson is the person for whom our airport is named. His was a very prodigious legacy. Mr. McGhee began his career in Knoxville operating a meat packing plant on Gay Street. 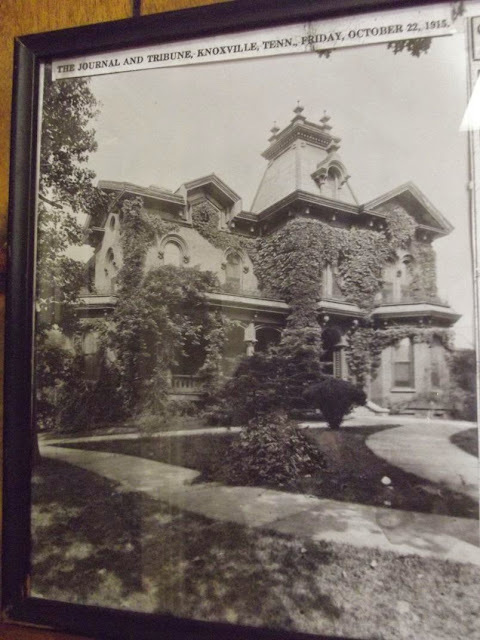 It is not entirely clear if this plant occupied the same plot that is now known as 310 S. Gay St. We do know, however, that McGhee invested in many land development projects, so that may be how this particular parcel became part of his estate. In any case, McGhee owned a row of two-story buildings on the spot as early as 1870. They were collectively called the McGhee Block. Collectively they housed a wholesale liquor store, a grange, a tailor, a produce store, a rag supply and a drug store. The building preceding the McGhee was not a victim of the "Great Fire of 1897". Rather, it burned in another fire in 1902, which the Century building again survived. It appears that C.M. McGhee commissioned the building of a larger wholesale house on the site of the smaller building. 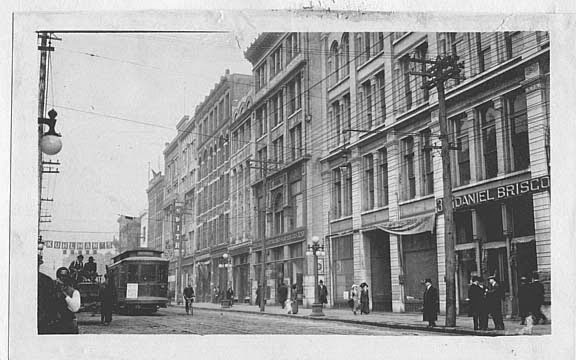 308 S. Gay Street, before 1897, at extreme left (two story building). The Century Building (still standing in 2014) is to the left with the two ornamental gables. In 1903, C.M. McGhee would replace the small, burned, two story edifice with a five story, two bay building on par with the newly rebuild heart of commerce in Knoxville. The McGhee Building just after construction in 1903. 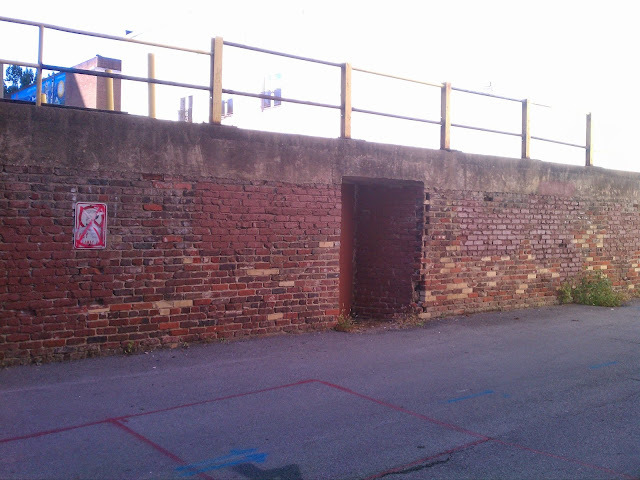 It was of semi-mill construction with thick, brick exterior walls. The first floor was marked by two, large doorways capped with scroll work that was repeated above the third floor and on the cornice. The McGhee building does not seem to have ever housed a business by the name of McGhee. It was originally occupied by the Broyles, McClellan, and Lackey Company, which sold farm equipment and seed. For a brief time it housed the Shield and Gillespie Clothing Company. Later it housed various furniture concerns including the King Mantel Company, Sterchi & Haun company (which would become Sterchi Bros.), and then Haun Furniture. 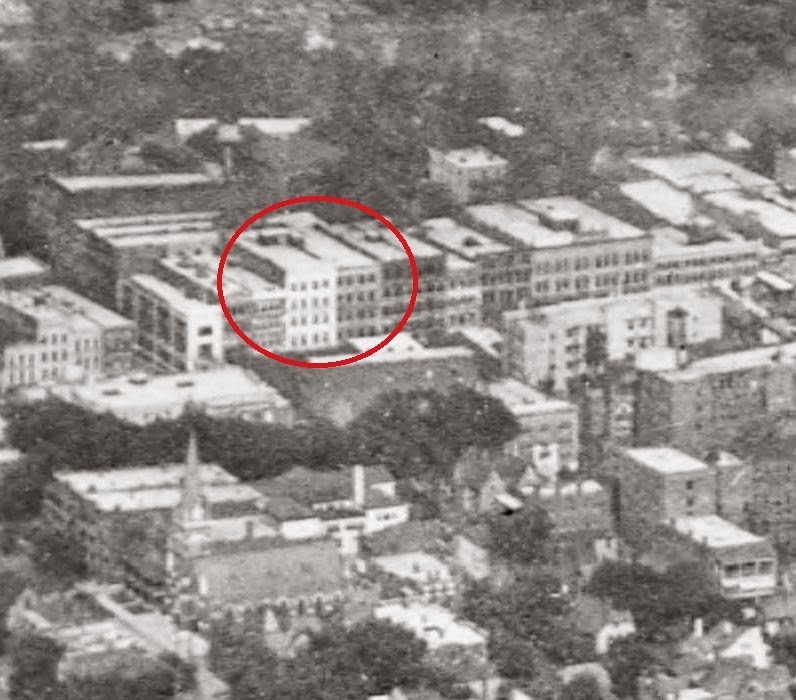 In its last years, Walker's store occupied the address 306 (the northern half of the building), while Bill Vasey (Vasey's) Furniture Store occupied the southern half. A fanciful 1908 rendering by the Shield Brand Clothing Co. showing their marquis on top. The building never looked like this. Shield got its own building later, on the 100 block. A very early photo of the block. The McGhee is to the left with the square shaped protrusion. The dark building with the stripes is the Century Building. King Mantel and Furniture Company in the McGhee Building. Late 1920's/early 1930's. Sterchi and Haun at the McGhee. 1930's The McGhee divided into two fronts (by paint) housing Walker's in the norther half. Close up on Walker's, the southern side looks vacant. Sterchi may have moved down the street at this point. Looking south down Gay St. early 1960's. The McGhee is identified by the "Furniture" sign at the right. This time it is Bill Vasey Furniture. 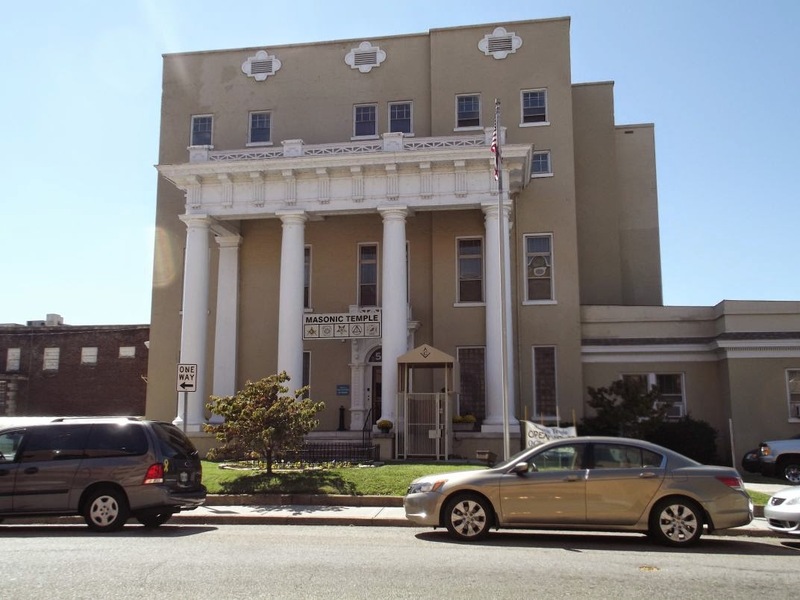 "A city building permit was obtained Friday on behalf of the estate of C.M. 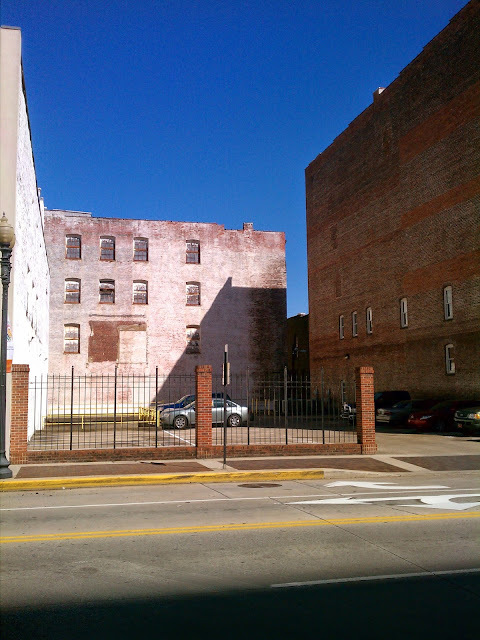 McGhee to construct a two level parking lot at the 308 S. Gay St. site formerly occupied by Vasey Furniture Company. The lot, estimated to cost $47,000.00 will have basement parking and street level parking space and a small office. David B. Lieberman is architect and Brownlee-Kesterson Construction Company is the contractor, according to the permit which also stated that the parking had been approved Friday by the city traffic engineer's office." Interestingly, the parcel was still part of the McGhee estate in 1969. As late as 1985, it was owned by a group called McGhee Properties, when it was sold to Rowland and Rowland P.C. I had always assumed that the hole in Gay Street at this location was merely a surface parking lot, but it is in fact a two story parking structure. Here is how it looks today. 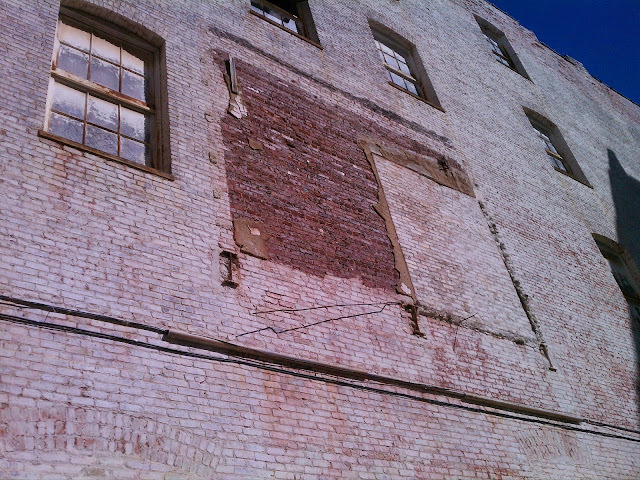 The hole that used to be 306 and 308 S. Gay Street. Note that the parking lot is at grade. That gap next to the Century Building used to be the McGhee Building. You can still see the scars that were its floors. The only thing that remains of the McGhee Building, the rear foundation wall that makes the back wall of the basement garage structure. 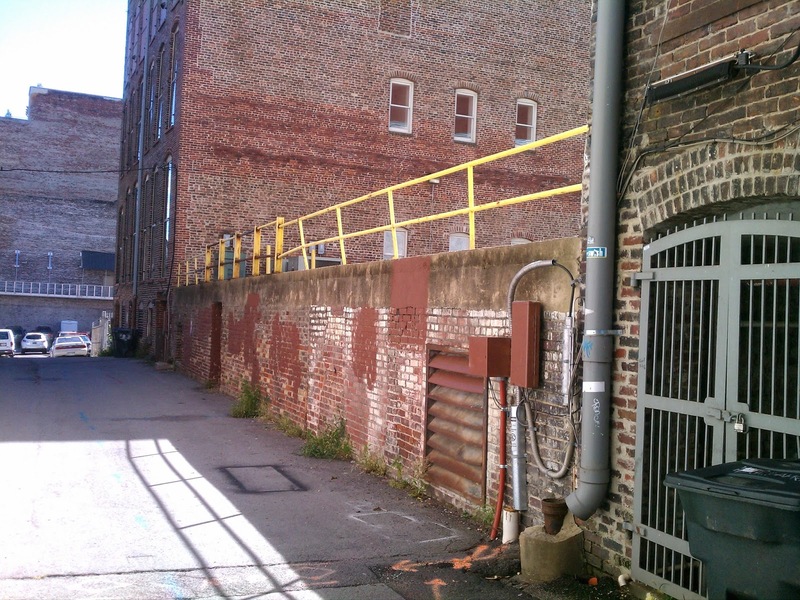 Another shot from Fire Street Alley looking toward the Century Building. There are cars inside of that wall. 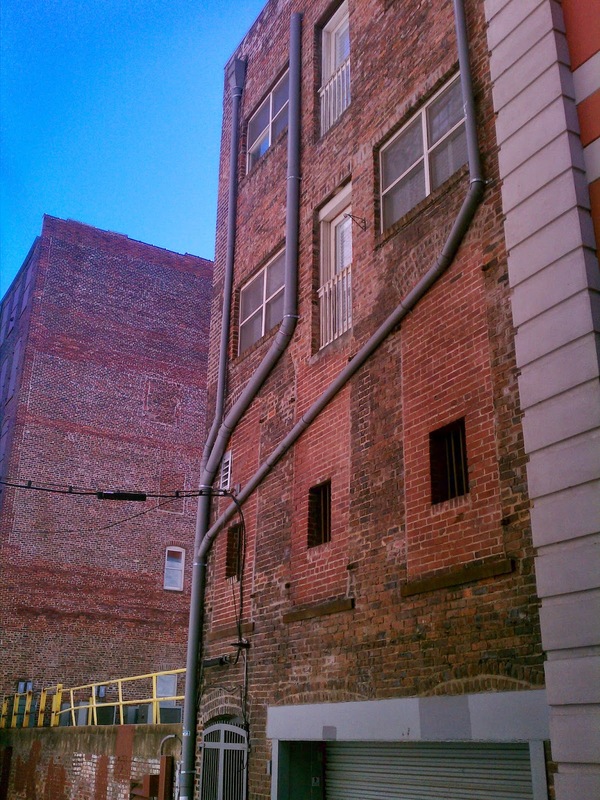 One thing I discovered when researching this building is that there was once a bridge from the northern half to the building across Fire Street Alley. The scars of that bridge are still there today. The scars of a former flyover bridge from the McGhee, about two floors up. 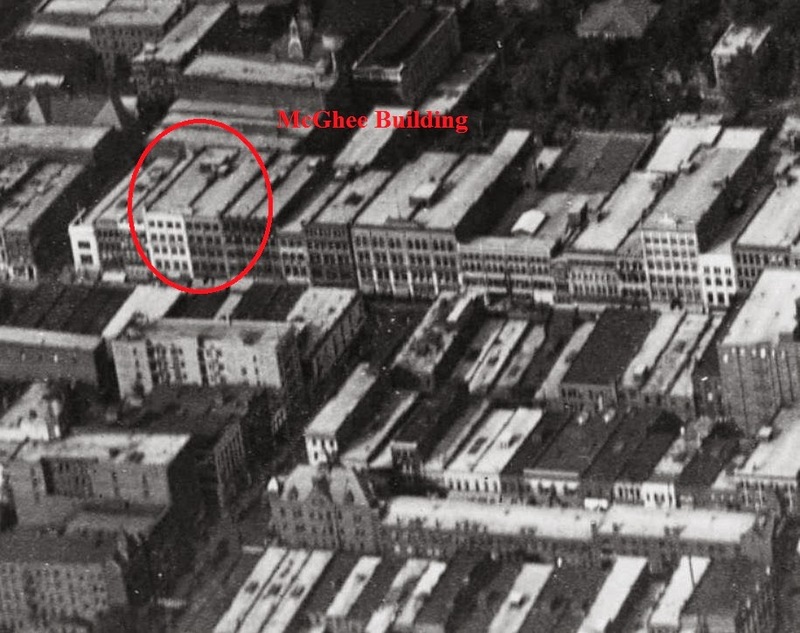 And now for the traditional aerial shots showing the missing McGhee Building. From a different vantage, looking east, southeast. Holes on either side of the Century Building. The one to the left once housed the McGhee. This hole has been vacant since 1969! The Century Building casts a shadow where the McGhee Building once stood. There you have it, the second big gap on Gay St. Now for the bonus round. As I mentioned before, I thought that there was a second building here that had disappeared. Well, it's still there but it looks nothing like it did when it was built. 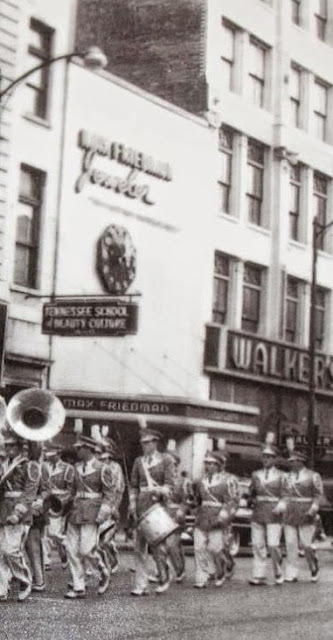 The earliest photos that I can find show it being the Federal Clothing building, but most Knoxvillians will remember it as Max Friedman Jewelers. Let's take a look. Federal Clothing Stores, McGhee to the right. 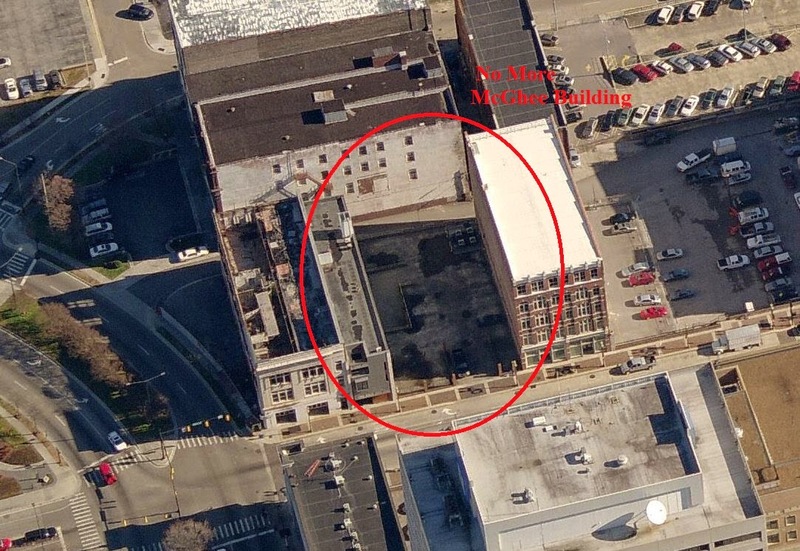 I've cropped the McGhee building out of the above photo so that we can focus on the Federal Clothing/Friedman's building. A detail of the elaborate window openings and cornice. In the 1930's, the building housed Bill's Auto parts, a business which seems to have moved all over the city during its long history. Bill's Auto Supply occupying 304 S. Gay St.
A detail shot of the Bill's storefront. The principal reason for my confusion regarding this building is that it looks nothing like it did back in the 1930's. Sometime in between the 30's and the late 40's, the building suffered major fire damage which cost it its top floor. Then, in the push to modernize Gay street to compete with suburban shopping centers, a metal face was added with a clock that would become iconic in downtown Knoxville. How 304 S. Gay St. would look from the 1940's until the 1990's. 304 was the home of Max Friedman's Jeweler.Mr. Friedman's store was an anchor and gateway to what was then Knoxville's Jewish community that centered around Vine Avenue from the 200 block of Gay Street all the way on Vine to the old Temple Beth-El. Mr. Friedman, an immigrant from Eastern Europe, was a highly regarded political figure and one of Knoxville's most powerful Jewish citizens. It is said that he bore a striking resemblance to Harry Truman. An old family tale credits him with giving FDR the idea to call his political package the "New Deal." He also served two decades on city council.One can learn all about Mr. Friedman and the Jewish community of Knoxville in the book A Separate Circle: Jewish Life in Knoxville by Wendy Lowe Besmann. His shop sat vacant for decades after Mr. Friedman retired. In the 1990's, the metal skin on the front of the building was removed and the building had a brick front that reflected all that had been done after the 1940's fire. The building was owned by Cormac McCarthy's brother Dennis for a short time in the late 90's. In the above photo, you can see that by 2007, almost nothing remained of the original facade. 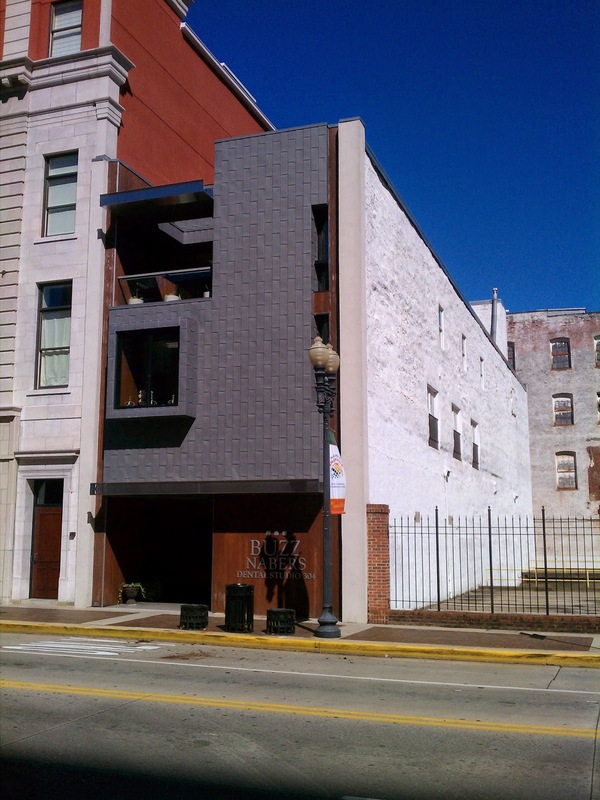 The building was purchased by Everettt Properties, LLC who commissioned Sanders Pace Architecture to revamp the street face of the old building. It now looks like this. The Federal Clothing/Max Friedman Building today. During the 2007 renovations to the building, the Crimson building next door caught fire and was completely gutted. 304 survived to be completed. Sanders Pace received numerous awards for their design. You can read all about the redesign process here. It isn't until you look at the rear of the building that you realize that it is over 100 years old. So, Federal Clothing / Max Friedman's Jewelers is still there today, housing Buzz Naber's Dentistry and looking completely modern and sophisticated. The McGhee Building is but a distant memory. 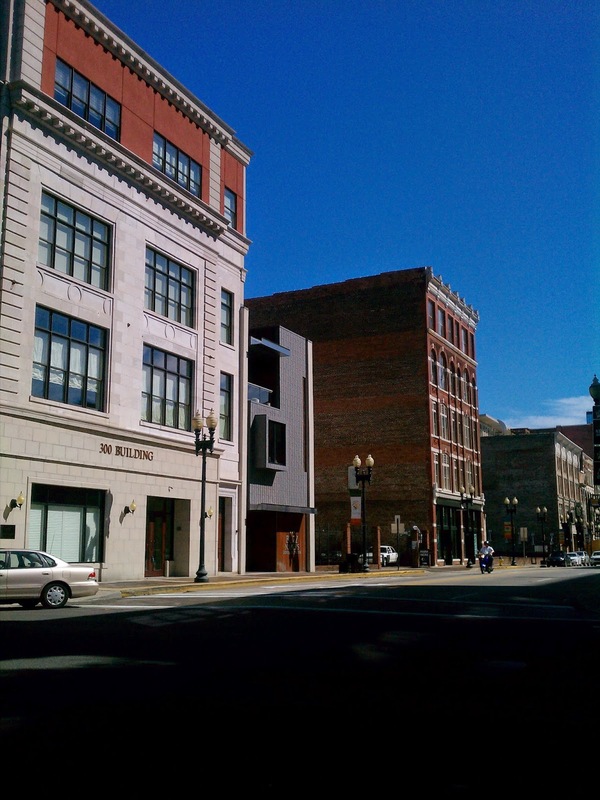 Perhaps the owners will someday decide to fill in this gap in Gay Street. Just a few days ago, I'd walked north along Fire Street with a friend, after showing her the changes behind the nearby stretch of S. Gay Street just to the south, as detailed in your previous post (Terminal Building). We wondered aloud then about the backs of the very buildings, past & present, you note in this entry. We'd noticed the flying bridge remnant, for instance. 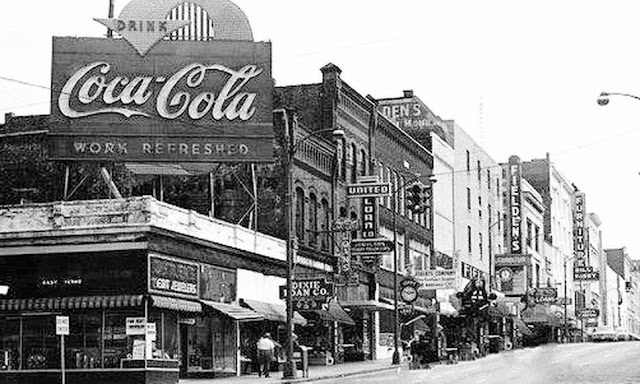 I look at Knoxville's historic architecture with a deeper appreciation, thanks to your blog. Might I suggest a future exploration of the 3 buildings just 'round the corner, at 200 W. Summit Hill Drive (old Commerce Ave)...Bacon & Co., which produces Vols-related clothing. Some of the brick work is quite involved and, while I've read a bit about recent mods to the facade (2013), I'd like to know more about the history of those buildings and the changes along that immediate stretch, wrought by urban development. Thanks and admiration for the work you did on this one. The details of the buildings' history is a bit more obscure, but equally interesting.